Home / Blog / Meet the Duzzle Art! After creating the impressive Space Shuttle Mosaic for Ripley’s, made with 5,951 keyboard pieces, (more about it here: http://www.ripleys.com/weird/daily-dose-of-weird-wtf-blog/unusual-art-and-fashion/keyboard-keys-space-shuttle/), mosaic artist Doug Powell stages a comeback with his amazing puzzle mosaics. It was in 2001 that Doug started experimenting with random jigsaw puzzle pieces, and in 2007 that he started gathering them to create portraits that capture facial features right down to the finest features, like lips or eyelashes. The artist is renowned for his unique talent of assembling puzzle pieces together, cutting and shaping some of them to make his works even more realistic. 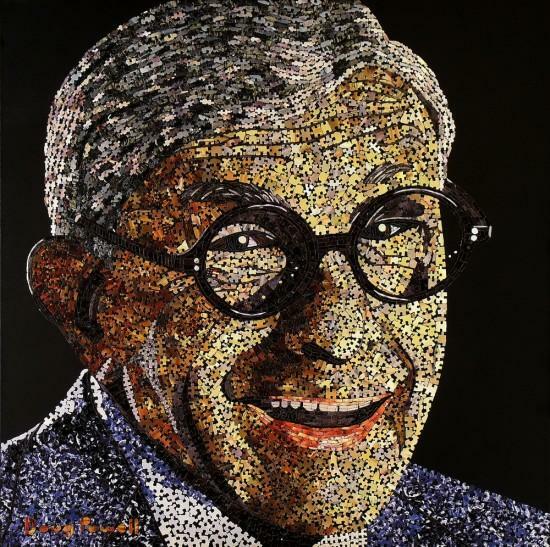 He calls his mosaics “Duzzle Art” replacing the “P” in puzzle with the first letter of his name to personalize his art. Each of the Duzzle Art masterpieces is made from thousands of individual puzzle pieces, representing large detailed portraits of iconic personalities like Ingrid Bergman, Sophia Loren and the Statue of Liberty. His works are exhibited internationally in private, public and corporate collections. Some portraits of his Jigsaw Puzzle Art Mosaics and Computer Key Mosaics are displayed in Ripley’s “Believe It Or Not!” museums in Times Square, New York City and Hollywood, California.